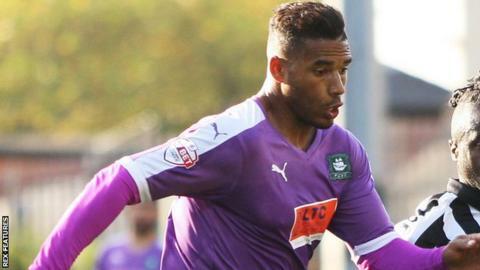 Plymouth Argyle boss Derek Adams says he is pleased they have not depended solely on Reuben Reid for goals. The striker has reached 20 goals in the last two seasons for the League Two side and ended a 15-game drought in their win over York on Monday. "We've shared the goals out very well throughout the team - we haven't relied on one individual," Adams said. "Reuben has been relied on here for a couple of seasons but this season we've scored goals throughout the team." Reid, 27, missed two months earlier this season with a hip problem and is the Pilgrims' fourth-highest scorer this campaign, scoring seven times. Meanwhile, Adams has said he is unhappy with the Football Association's decision to rescind the red card given to Morecambe midfielder Alex Kenyon for a challenge on Carl McHugh in their game on Good Friday. "I've watched the tackle a number of times and if you're going to lunge in from that distance, with that velocity, then you deserve a red card," Adams told BBC Sport.